December 1978: As the result of a chance photograph of Greta Garbo, Bill Cunningham published a group of his impromptu pictures in the New York Times, which soon became a regular series now known as his street style column. 1992: Tim Berners-Lee launches the first Web site, which had a “What's New” page informing readers about new information related to the Web site. 1994: Claudio Pinhanez of MIT publishes his “Open Diary,” a Web page documenting his life. Also, online diarist Justin Hall gains notoriety for creating a “personal homepage” on the Web covering his day-to-day activities in very revealing detail. December 1997: Jorn Barger starts a daily log of interesting Web links published in reverse chronological order, calling it Robot Wisdom WebLog. The term “Weblog” is used online publishers to include any page with frequent short posts in reverse chronological order. 1998: Open Diary becomes one of the first online tools to assist users in the publishing of online journals. Other online journaling tools emerge, including LiveJournal (1999), DiaryLand (1999), Pitas (1999), Blogger (1999), Xanga (2000), Movable Type (2001) and WordPress (2003). Spring 1999: Online journal author Peter Merholz takes Jorn Barger's word “weblog” and splits it into the phrase “We blog.” Blog soon becomes shorthand for weblog — and 13 years later it's still the term we use today! 1999: The development of RSS, or Really Simple Syndication makes it easier for people to subscribe to blog posts, as well as distribute them to other sites across the Internet. 2002: Fashion blogs begin to emerge on the internet. 2003: Glam Media, a company with more than 1,500 lifestyle websites and blogs, including Glam.com, is founded. The basis includes an ad network, where blogs come together under umbrella advertisements. September 2003: Kathryn Finney of The Budget Fashionista was invited to New York Fashion Week. October 2004: Manolo the “Shoe Blogger” starts writing posts to his site. February 2004: The launch of Flickr, a photo-sharing community, helps popularize photo blogging. 2004: Videographer Steve Garfield launches his video blog and declares 2004 “The Year of the Video Blog,” more than a year before the birth of YouTube. 2005: Julie Fredrickson creates fashion blogging network Coutorture, which grows into an online publication, community and blog network comprised of over 240 editorially selected fashion, beauty, perfume, accessory, and streetwear blogs. September 2005: The Sartorialist, aka Scott Schuman, begins blogging about fashion on the streets. According to an article on Business of Fashion: According to Mr. Schuman, The Sartorialist was originally inspired by Brooklyn-based writer Grace Bonney’s interior design blog Design*Sponge. “I could tell she was doing it by herself and I liked the idea that she was having an interaction,” he said. “She had like 30 comments on a post and I thought that was really cool.” Schuman decided to start a similar blog for fashion after examining a series of photos he had taken of a few stylish guys in New York’s Fulton fish market while on a photography course. 2006: The Fug Girls start writing for New York Magazine. 2006: The launch of Twitter, one of the first “micro-blogging” communities that allows user to publish and receive short posts via the Web, text messaging and instant messaging. 2006: A research report from the Pew Internet and American Life Project estimates that 12 million U.S. adults publish their own blogs. 2006: Julie Fredrickson ambushes Anna Wintour at New York Fashion Week. 2007: Sugar, the San Francisco site for women’s content, announced it has acquired Coutorture. 2007: Technorati reports it is tracking more than 112 million blogs worldwide. 2007: Rumi Neely starts posting her vintage finds to eBay. September 5, 2007: Founded by Jennine Jacob, IFB is created. 2008: Neely launches a separate site to her eBay account, called “Fashion Toast,” and posts her first personal style photos. September 2009: IFB hosts an event with two panels about fashion blogging which evolved into the IFB Conference (and we are now presenting our 7th conference this September)! 2009: Dolce & Gabbana made news by filling its front row—typically the sole provenance of A-list actresses and Anna Wintour—with fashion bloggers, even equipping them with laptops. 2009: The Federal Trade Commission (FTC) publishes its regulations regarding bloggers. September 2010: Kim France, the founding editor of Lucky Magazine, leaves the print biz to start her own blog, at age 48. 2010: Leandra Medine, creator of The Man Repeller, was studying journalism in college when she started her blog. 2010: The FTC publicly investigates the company Ann Taylor after mandating an update that stipulates that bloggers must disclose “any material connections they share with the seller of the product or service” when writing about it. Bloggers and brands can be fined up to $11,000 for failing to reveal sponsorships. According to Mashable, “Ann Taylor invited bloggers to preview its Summer 2010 LOFT collection, promising attendees a ‘special gift' and entry into a ‘mystery gift-card drawing' for those who submitted posts to the company within 24 hours of the event. Ann Taylor avowed to reveal the value of the gift cards, which ranged from $50 to $500, to bloggers after receiving their posts.” No fines were levied. 2012: Nick Axelrod leaves Elle for Emily Weiss's beauty blog Into The Gloss, where he is in the early stages of hiring contributing writers. 2012: Leandra Medine is also expanding her content by trying out new writers so that she may transition from a “blog” to a website — which she describes as a cross between Vogue and Jezebel. 2012: Tavi Gevinson parlays Style Rookie into Rookie Mag, a larger site for young women. So, what's next in the timeline? It seems that a few of the more prominent personal bloggers are expanding to develop bigger websites. Does this mean that bloggers are headed to be the next big time fashion editors, presenting their insight on the web rather than in pages of a glossy? What do you think? No mention of Susie Bubble one of the first people to post fashion photos of their own outfits? Yet you mention Bryanboy and Fashion Toast. Nothing? Hmmm… C+. Agreed. As usual IFB seems to have a laser focus on a particular type of style blog. Which is fine I guess. Agreed! Fashion Toast? Seriously? Susie Bubble consistently writes one of the best blogs out there and yet she always seems to be forgotten in recaps like this. Nice work! I was actually just thinking of trying to write something like this, but but its admittedly a difficult piece to put together. My only qualm is where is the mention of Chictopia, Lookbook, and the original – StyleDiary? Really, really well done overall though! Many years ago, in 2005, the Manolo talked about the earliest fashion blogs, those he remembers reading in the 2003 or so, before he started his own blog. It was the most wonderful discovery, to find smart peoples talking about clothes on the intertubes. So exciting and fresh. In particular, the blog No Good for Me, (which is still around!) deserves much credit for being one of the earliest of the early blogs. What a fun read! Fashion blogging and tech go hand in hand so I know a lot of people who will “nerd-out” on this post (or maybe it’s just me!). Keep up the array of articles! many an inaccuracy and oversight here. Blog is a great means of reaching and communicating with the audience. What started as a fashion illustration portfolio, is now my blog where I share what’s left behind my job in the magazine, tell opinion and reveal knowledge that may be useful to others. I think lots of people, not just in fashion area, will start (ok, already are) using personal blogs. At least soon it will be like a must have in my country, where all the trends are 2-3 years late. 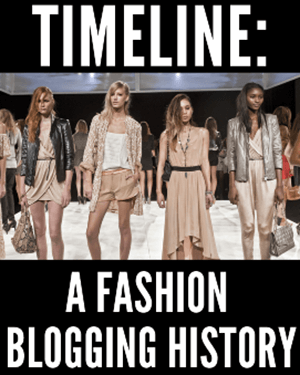 This post is amazing learned so much and is very helpful as a fashion blogger to know the history and heritage of where fashion blogging came from. I love how it began in december of 1978 by BIll Cunningham and he is still to this day working/blogging and capturing fashion one shot at a time in NYC. He is iconic and inspirational.